Romantic comedy starring Héléna Noguerra. In the years since her husband was killed in a motorbike accident, 40-year-old bank worker Alice (Noguerra) has steadfastly refused to move on, continually rebuffing her best friends Pénélope and Isabelle (Anne Girouard and Frédérique Bel)’s attempts for her to cast off her widow’s weeds and find a new man. 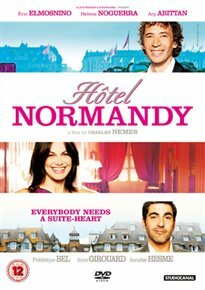 But when she finally agrees to accept their offer of a weekend of pampering and culture at the exclusive Hôtel Normandy, she soon finds herself the centre of attention for love rivals, Jacques (Eric Elmosnino) and Yvan (Ary Abittan).